A liquid magnesium fertiliser for foliar application on all types of horticultural crops. 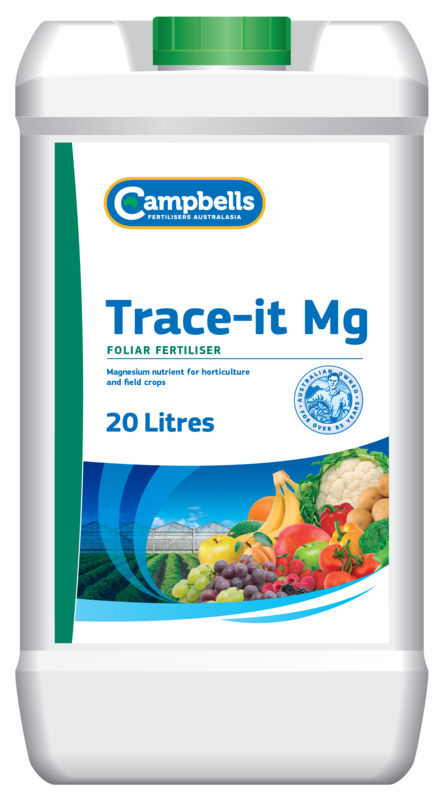 Campbells Trace-it Mg is a liquid fertiliser that is ideal for the correction or prevention of magnesium deficiencies in many horticultural crops. The nitrogen component of Trace-it Mg assists with effective uptake and transfer of magnesium within the plant. Magnesium is an essential constituent of chlorophyll and is also involved in enzyme reactions. It effects the translocation of phosphorus and is involved in water uptake by the plant. Magnesium foliar applications can be used to supply ongoing Mg requirements or to correct a magnesium deficiency. In many cases, soils can have adequate magnesium levels, however due to unfavourable conditions for uptake via the roots; foliar magnesium applications are the only option. Trace-it Mg foliar applications work excellently in conjunction with ground Mg applications, where magnesium demand is high. Campbells Trace-it Mg is recommended for foliar application. Recommended rates of application vary between 2-5 L/ha – specific rates will depend on the crop, stage of crop development and the magnesium requirement. Before application, seek advice from your Campbells Trace-it Mg distributor or your local agronomist.